This stunning 18ct gold diamond ring from The Forever Diamond collection, exclusive to H.Samuel, ha a total diamond weight of 1 carat. The Forever Diamond has a unique flower cut made up of 73 facets, the result is exceptional sparkle and radiance. Each Forever Diamond has been independently certified by the GSI for colour, clarity, carat and cut. It's your guarantee of quality and beauty. 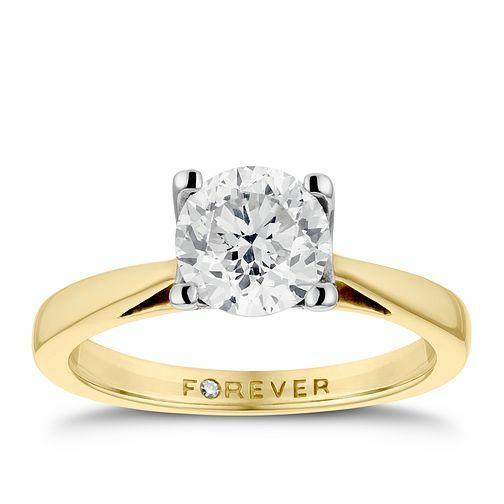 18ct Gold 1 Carat Forever Diamond Ring is rated 5.0 out of 5 by 2. Rated 5 out of 5 by Anonymous from Just stunning My husband bought me this ring for our anniversary. It is truly beautiful. I get so many compliments with this ring . Yes you pay the price but it's definitely worth it! Rated 5 out of 5 by Anonymous from absolute perfection Where do you start I bought this ring for my wife's 50th birthday she was delighted with it I am no expert on diamonds but the cut of this diamond is near perfect. The fitting is stunning you can see the diamond through the u shaped four claw setting absolutely beautiful cannot fault this ring WOW.